How to Have A Successful Yard SALE – Part THREE | Cook, Party, Enjoy! 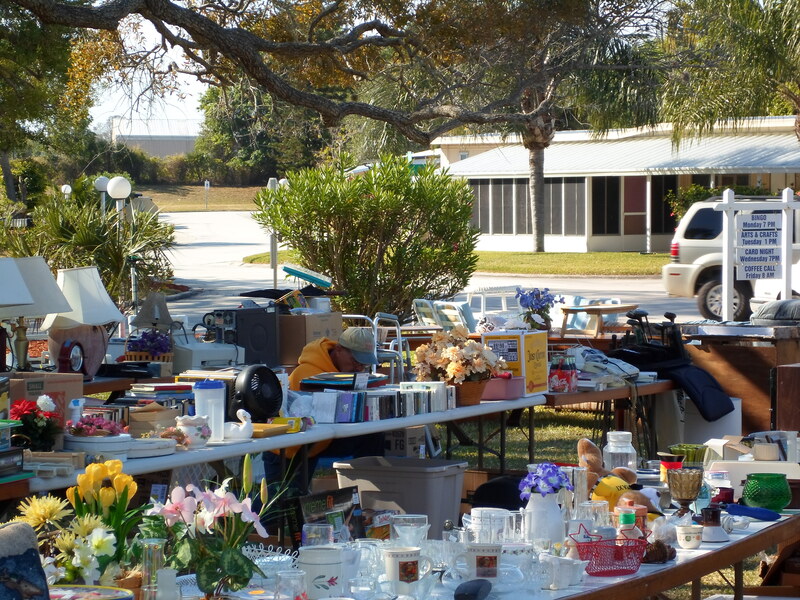 Where and when is Your Yard SALE? Includes – What you can use to attractively display your items. Selecting the location for your yard sale is pretty easy. If you plan to have the sale by yourself and you have a garage and it has available space it is a good place in case the sun is really hot or it is raining. Your driveway is also a good choice. You do not want to have it in the backyard if this can be avoided because you attract customers by sight. If they pull up and don’t see any activity because it is in the backyard they may not stop. If you are planning a combined yard sale with neighbors or friends, if someone lives on a cul-de-sac or dead end it is a good choice. Or you could consider the location that has the most traffic. If you are real ambitious you could ask a school or church if you could have it in their parking lot for a small fee. The things to consider if you are choosing a location other than your home is proximity to main roads and traffic. The more people who see your signs the more customers. Choose the date that best suits your schedule but consider trying to choose close to a pay day like the 15th or the end of the month. I advise to avoid holidays as many people have commitments. Another consideration is the duration of your SALE. Many prefer one day. I will sometimes do 2 or 3 days depending on how much stuff I have to sell. Sometimes I will start on Friday afternoon and end Saturday evening. I like starting and 7am and ending at 6pm. It is not unusual for shoppers to show up an hour early. These are usually the dealers looking to catch you off guard setting up and they can make some deals, but sometimes they are those dedicated ‘yard salers’ who have a long day planned and want to get a jump on things. If you put a list of your items in your ad they may have chosen to start with you because you have something they particularly want. You have the option to put up a sign stating your opening time or you can let them look at your stuff. It’s up to you. Your home garage or driveway. A friend’s house if near high traffic roads. A Church or School parking lot. Choose 1, 2, or 3 day sale venue. When items are displayed at waist/table height they are easier seen and touched. Keeping your stuff off the ground and out of boxes is your goal. 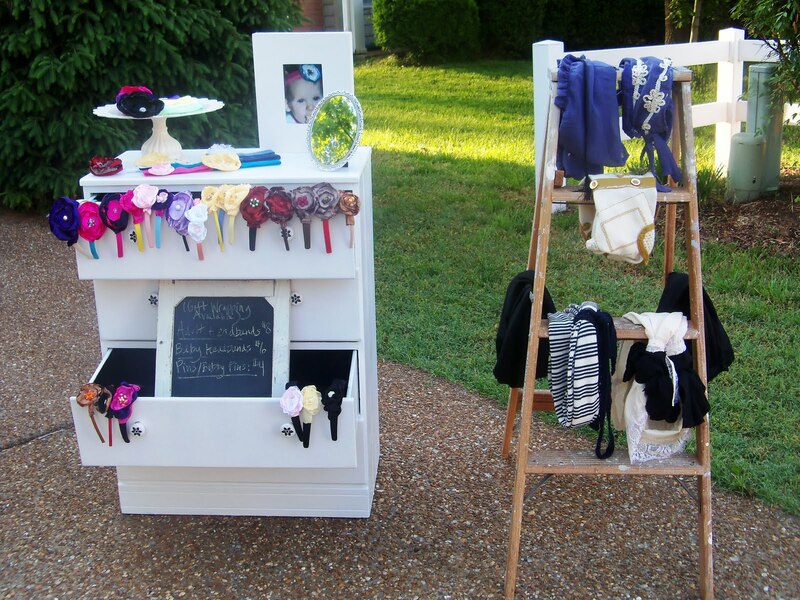 To do this you need tables, if you don’t have any or not enough, Borrow, or buy portable tables to display your items. But don’t buy tables if you won’t ever need them for anything else. You can make tables that will work for your sale using stuff from around your house or scrap wood more about this later. Use large items you have for sale to display your stuff until it is sold. Be sure they have price tag and people know they are available. You can make tables from empty or filled boxes turned upside down. Boards run between two ladders will work to display items, or you can make your own display tables. I recommend going to a house under construction and asking if you can pull some of the trashed lumber out of the bin. I have never been turned down when I have done this. I look for pieces that I can turn into shelves, clothes racks, or tables. 2×4’s work great and there are always a lot of these in different lengths in the trash. You might even score some plywood. Consider a door on two sawhorses. Borrow or make sawhorses if you don’t have them. For the top use a door from inside your house, like a closet or bedroom door. 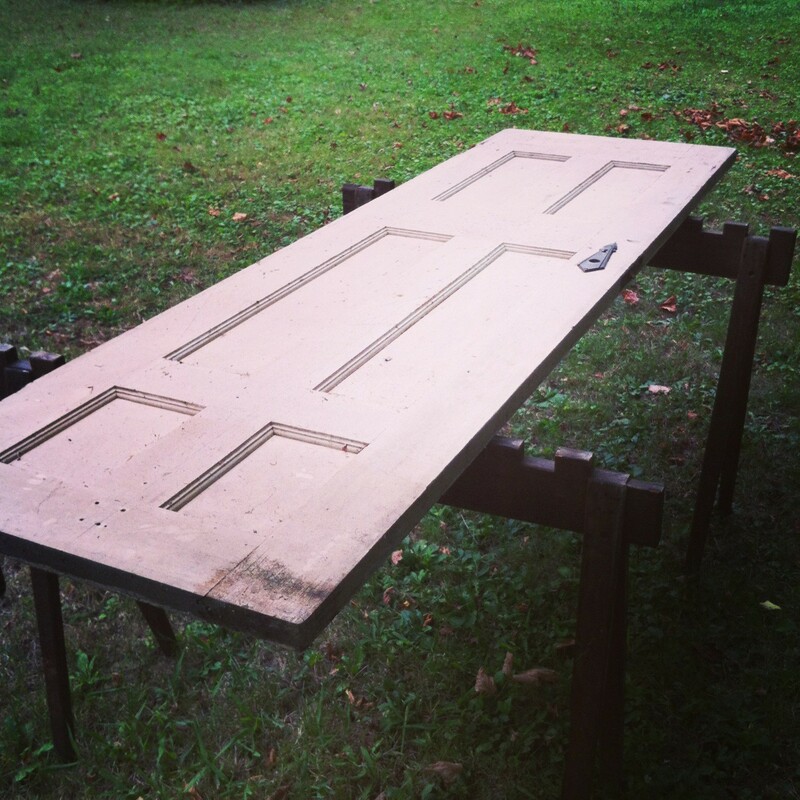 You can easily remove an interior door by just using a screwdriver and a hammer to tap out the pin in the hinges (you do not have to remove the hinges) Then when your yard sale is over just put the door back on its hinges and tap the pins back in. 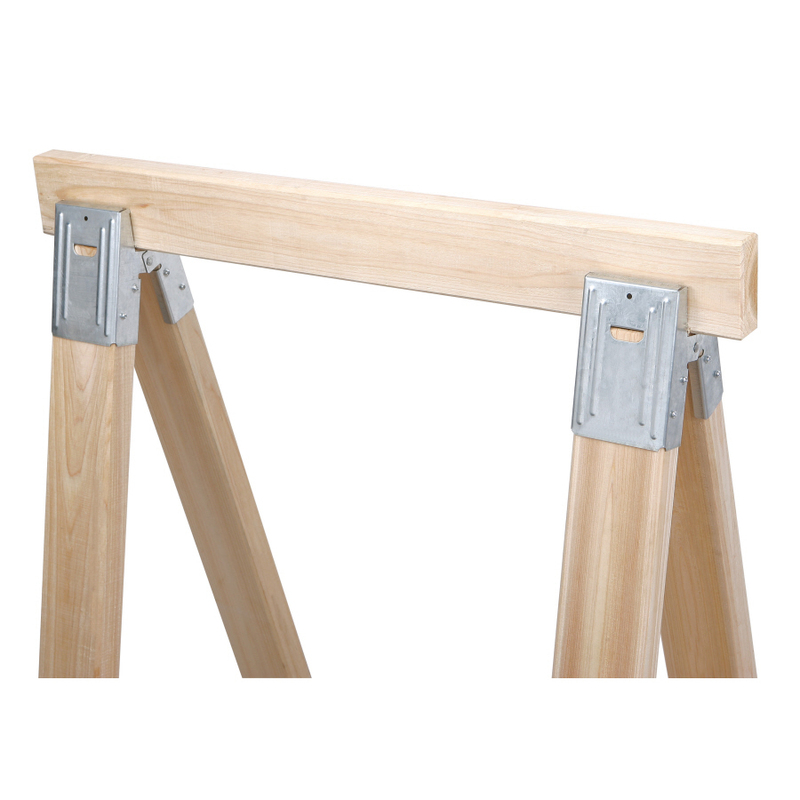 Make your own sawhorses with brackets from Lowes or Home Depot under $8 and scrap 2.4s. Need racks for hanging clothes, quilts or linens. 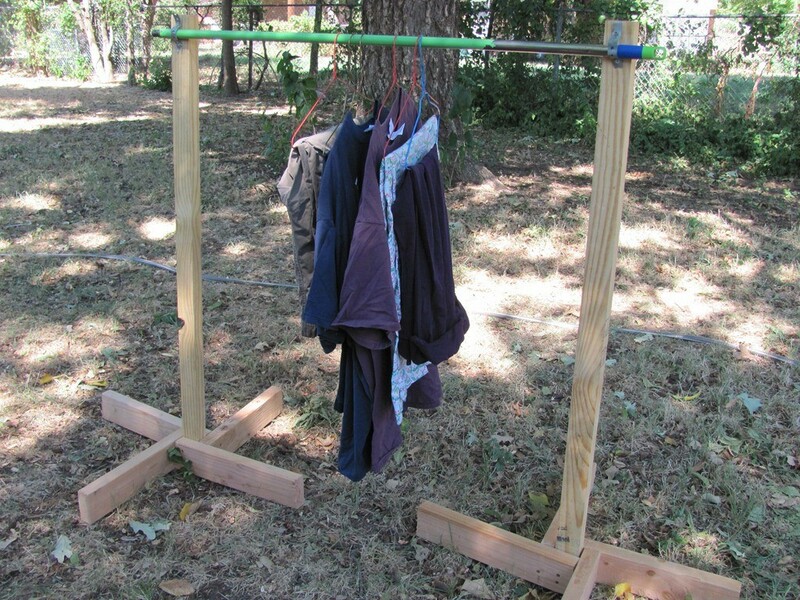 You can run clothes line between trees, hang stuff from branches, borrow those roll around laundry hanging units, buy it but they are about $19 at Walmart or make some hanging racks. See the pictures below for ideas. 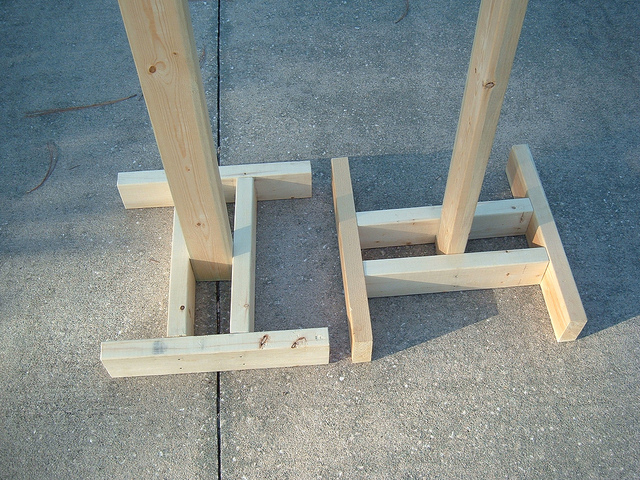 To make a clothes rack make two bases like this and then run a 2×4 across the top. 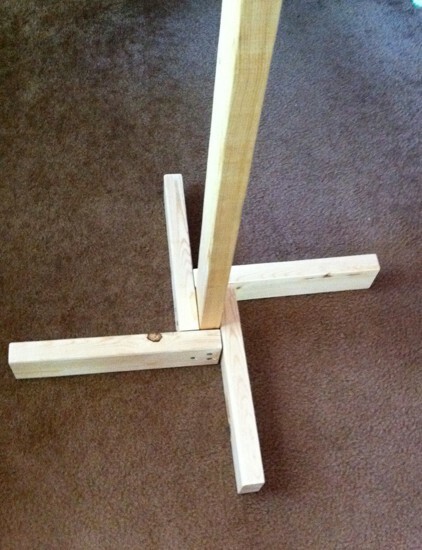 To make a table use this same idea but make the bottoms and tops a little bigger so you can run plywood or 2x4s across the top to create a table top. Clothing rack made by building two stands and attaching, in this case, a mop handle between the two stands using stainless steel plumbers tape. 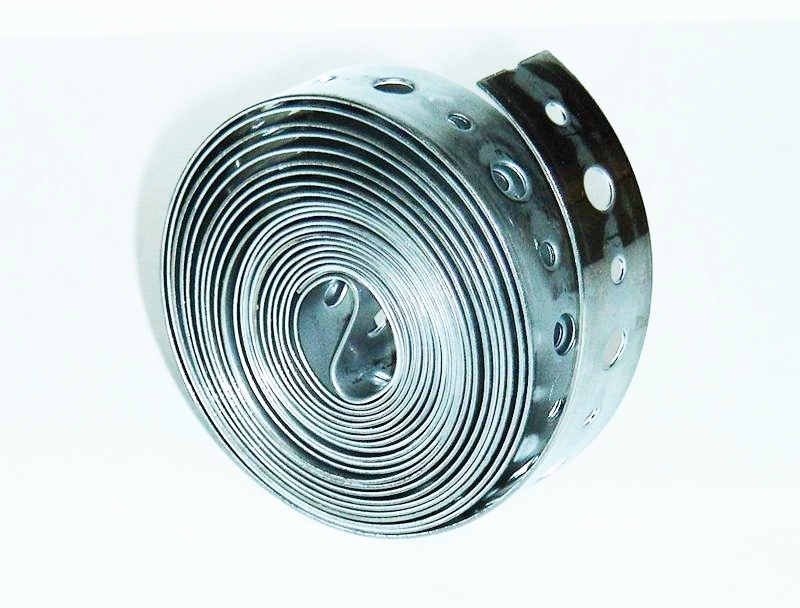 This is what the stainless steel plumber’s tape looks like. Plumbers use it to hold up duckwork and pipes. This stuff is great for attaching stuff. It is inexpensive, easily bent into shape, and then just screw it where you want it. I also use it to hold top heavy furniture like bookcases to the wall especially in a child’s room. Only 2 parts left of the yard sale series and you are ready to have your sale. How and where to advertise your Yard SALE? If you missed one of the Yard Sale Series find it below and click to read it. Time Line for the yard sale. Where and when will you hold the Yard SALE and what will you use to display your items? Thanks for reading my blog… Good luck with your Yard Sale! 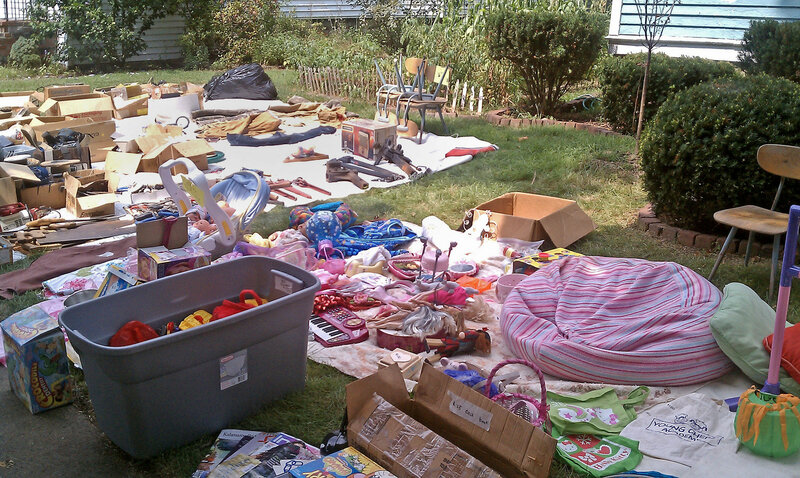 until later betti b.
Pingback: How to Have A Successful Yard SALE – Part TWO Quick Peek at TIME LINE | Cook, Party, Enjoy!